Travels and Wandering: Eat my Heart! This is a repost or should I say transferred post from my bravejournal blog. I can't use my CPU yet so I decided to transfer this post from that blog to here. Comments are also copied and pasted here before I deleted that post. This was originally posted on October 25, 2009. 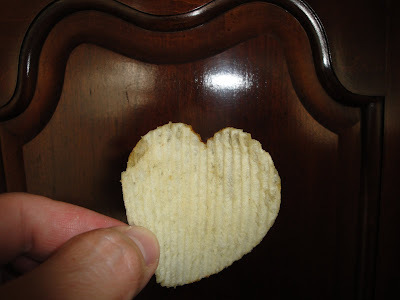 My husband love eating potato chips. One of his most favorite is the ruffled potato chips. He was eating it the other day and she said "Hey hon, here's how much I Love You, I would be willing to let you eat my heart!" And he gave me this piece. I didn't eat it though, I put it in my collection of memorabilia. I am not very fond of eating chips, only if I am in the mood. That's how cheesy and romantic my hubs is lol. Marriage is definitely blooming when humor and love are combined isn't it? So sweet and romantic! I love it. wow ang cute naman nyan sis.. hugis puso talaga ha..
yes, I only eat potato chips among the junk foods. Oh how so sweet naman... we only eat chips in the Phil. or when someone will give us. oh, such a lovely shape and sweet hubby :-)! so sweet naman. naku tokaya kainin mo yan bago pa madurog, ehehe. aawwwwwww...so sweet naman ni hubby....hehehhe...d mo pala kinain...balutin mo baka before kau uuwi dito wala na yan...kinain na ng langgam....hehehhe...joke! Kahit siguro ako hindi ko kakainin itatago ko din.Mwah! ang sweet, pero you're sweeter rose.. at naku, kung ako yan, kainin ko, di ako sweet eh..haha..